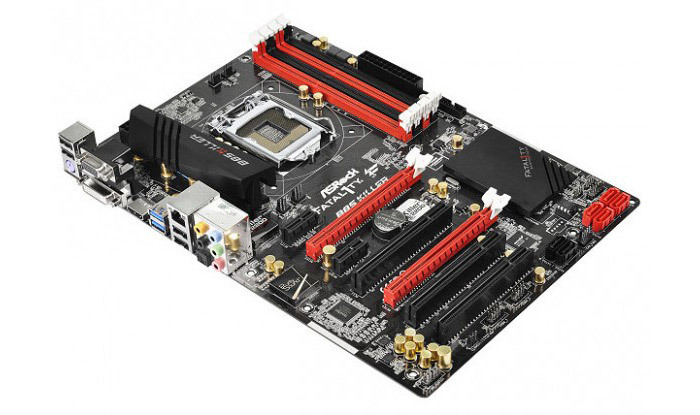 Do you want to have a gamer’s motherboard for less cash? Now this dream may come true with ASRock’s latest Fatal1ty B85 Killer motherboard – developed along with the world gaming champion Johnathan “Fatal1ty” Wendel. Quite naturally the new motherboard is based on the Intel LGA1150 socket and has a 6-phase power scheme, premium capacitors, Gaming Armor technology and more. The Fatal1ty B85 Killer is based on four slots for DDR3-1600 memory (up to 32 GB) and has one PCI-E 3.0 x16 slot, one PCI-E 2.0 x16 slot for Quad CrossFireX/CrossFireX, two PCI-E 2.0 x1 slots, three PCI slots, four SATA III ports and two SATA II ports with Intel Smart Response Technology and Intel Rapid Storage Technology. The rear panel also has PS/2 ports, D-Sub, DVI-D, HDMI and Fatal1ty Mouse Port (USB 2.0), a RJ-45 port, an optical S/PDIF port, three USB 2.0 and two USB 3.0 ports and 5 audio jacks. The mobo also makes use of a built-in Gigabit Ethernet controller by Qualcomm and Realtek ALC1150 audio. The Fatal1ty B85 Killer supports XFast 555 technology that includes XFast RAM for creation of virtual disks in RAM memory, XFast LAN for faster LAN work and XFast USB for faster USB data transfers. The pricing and the official launch date of the new motherboard are still unknown.